GDP growth in the last quarter of 2018 should have been in line with French domestic demand: weak. Instead, the economy expanded 0.3% quarter-on-quarter thanks to a surprising bounce from exports. The one-quarter export growth of 2.4%, coupled with weakened imports by weak investment and sluggish consumption (see below), allowed the current account deficit to decline, contributing to GDP growth by 0.7 percentage points, according to the first estimate published by INSEE. This is the largest contribution of foreign trade since 3Q17 and comes at a time when the effective exchange rate of the euro (its weighted-average exchange rate against the currencies of all trading partners in the euro area ) is at an eight-year high. The contribution of exports is, therefore, all the more exceptional. 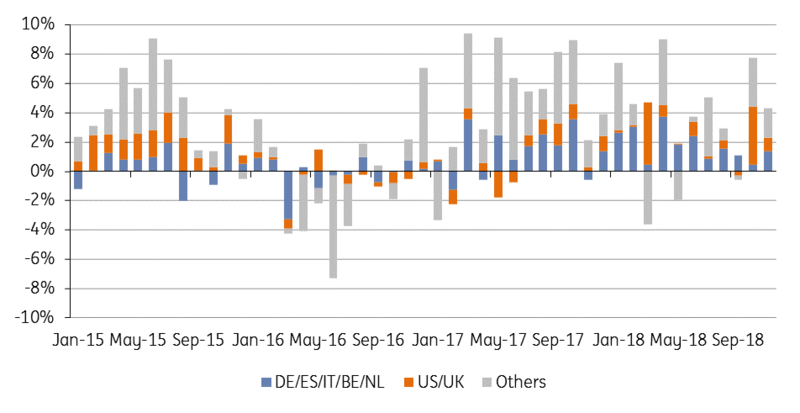 This is due to the particular weakness of the euro against the US dollar, which allowed stronger growth in exports to the US in October and November, while exports to France's main trading partners (Chart 1) were less buoyant because of the lower level of activity recorded in the eurozone. While net exports will have had a particularly high contribution to growth in 2018 (0.6 percentage points is the highest since 2012), we do not believe that this trend will continue in 2019. Indeed, the decline in world trade and the slowdown in the eurozone may have an impact on French external demand. On the other hand, the expected recovery in domestic demand is expected to increase imports. Finally, the recent gains from exports do not seem to stem from a particular improvement in the competitive position of France which has, at best, stabilised over the last two years, but rather from temporary exchange rate effects. After the positive surprise from exports, the growth report in the last quarter of the year only confirmed fears about the impact of the crisis of confidence generated by the "yellow vest" protests. Private consumption has stagnated, bringing its growth rate in 2018 to just 0.9%, the lowest rate since 2014. Household investment in new construction experienced another quarter of contraction (-0.4% QoQ after -0.1% in 3Q18) despite low interest rates. These figures, while in line with expectations, are nonetheless a major drag on growth. As the first quarter is expected to be only marginally better, consumption growth in 2019 is expected to be just over 1%. In contrast, business investment was still up in 4Q18, by 0.3% QoQ. This brings the growth rate to 3.9% in 2018, which is very positive given the weakness of domestic demand. If we note a slowdown in the last few months of the year, we nevertheless note that the use of production capacity remains high, which is why we do not expect a major drop in the pace of investment in 2019, especially as order books remain relatively well filled and financing conditions will remain very favourable. Domestic demand will still take time to recover from the abnormal levels of anxiety shown in consumer surveys at the beginning of the year. Given the weaker European economic backdrop that is expected in 2019 and 2020, we believe GDP growth will return to potential, or 1.3% YoY, in both years. If domestic demand recovers slightly, it is likely that external trade will weigh on growth (as it usually does) as the euro catches up some ground against the US dollar over the next two years and less dynamic world trade affects demand for French exports. Note that on this front, all forecasts are made under a ‘no hard Brexit’ assumption.